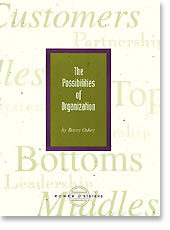 Home > Possibilities of Organization > Possibilities of Organization by Barry Oshry - Paperback. My business partner and I may be responsible for an increase in sales in the NE USA of The Possibilities of Organization. It seems every organization we work with, and everyone we coach, has some "System Blindness" and this book provides a unique insights into the worlds of Tops and Middles and a practical path to new "Door B" possibilities. We routinely give out copies of the book to our clients. When Tops read about the Top Reality they often say "I could have written that", Middles say the same thing about their Reality. This is a very useful book for coaches and OD consultants.